Join us in Rio de Janeiro, a city famous the world over, for the 2019 International Conference on Interpretation. 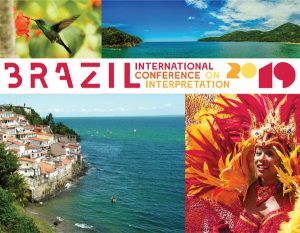 Hosted for the first time in South America, the International Conference on Interpretation takes place in the city that hosted the 2014 World Cup and the 2016 Summer Olympics. But it is the annual spring Carnival that Rio is famous for, along with its spectacular setting on Guanabara Bay. Fringed with sandy beaches (think Copacabana and Ipanema) and protected by towering Sugarloaf Mountain, Rio is a scenic, cultural, and recreational mecca. Rio de Janeiro, Portuguese for River of January, is located on the southeastern coast of Brazil. It is the second-most populous city in the country and the sixth-most populous in the Americas. Rio is the capital of the state of Rio de Janeiro and part of the city has been designated as a World Heritage Site by UNESCO as a Cultural Landscape. In recent times, the city served as the capital of Brazil until 1960 when the capital was transferred to Brasília. NAI members at interpretive sites in Brazil will help introduce you to the local attractions, foods, culture, arts, and history. There will also be opportunities to visit natural settings in the nearby Tijuca National Park, site of Corcovado Mountain and the famed “Christ the Redeemer.” Cultural landmarks—such as the Selarón Steps (a world-famous staircase by Chilean artist Jorge Selarón), Metropolitan Cathedral, and Cinelandia Square, where you can enjoy the architectural beauty of the Municipal Theatre—are part of the optional experience of the conference. May’s moderate climate, with daily high temperatures around 73F (23C) and generally sunny skies and beautiful beaches, add to the experience.